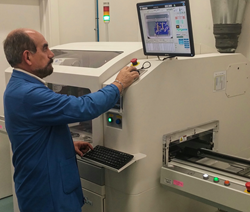 Electronics manufacturer MC Assembly has added a Fully Automated Conformal Coating System (FACCS) to its PCBA production capabilities. Our customers’ applications demand high PCBA reliability in tough environments and with this new solution we will provide the level of consistency and repeatability for those applications. Designed and manufactured by Trusted Technologies and Solutions (TTnS), the automated conformal coating system consists of three separate machines – an automated sprayer, magazine loaded cure oven and a stand-alone oven for bake-cure. MC Assembly Chief Operating Officer Luis Ramirez says the new automated system will save time and improve efficiency. “Our customers’ applications demand high PCBA reliability in tough environments and with this new solution we will provide the level of consistency and repeatability for those applications,” Ramirez said. Conformal coating is a process of covering electronic assemblies with customer-dictated material to protect the circuit board from damage. “Just like covering wood floors with urethane varnish to protect the floor from scratches, conformal coating adds acrylic- or urethane-based material to protect the electronics from the environments that they’ll be subjected to,” said Andrew Nunenkamp, Manager of Manufacturing Engineering at MC Assembly. Conformal coating is must-have requirement for many MC Assembly customers to protect electronic circuits from the effects of vibration, moisture, temperature and dirt. It has become a necessary process in supplying MC Assembly customers with total manufacturing solutions. According to Nunenkamp, the biggest advantage to conformal coating is the standardization of the process. For more information about MC Assembly, please visit http://www.mcati.com. MC Assembly (http://www.mcati.com), based in Melbourne, Fla., with operations in Billerica, Mass. and Zacatecas, Mexico, is a national leader in the contract manufacturing arena with annual revenues of approximately $200 million. It provides turnkey solutions to original equipment manufacturers and focuses on assembly of medium volume, medium mix printed circuit boards assemblies (PCBAs) and box builds. MC Assembly's capabilities include surface mount and pin-through-hole interconnection technologies, PCB and box build DFM, DFT, DFA engineering, in-circuit, functional and environmental testing, full box-build and direct order fulfillment.